This is the fourth year I have had my students work through a basic course in coding. We have used the activities created by code.org for our practice. Last year, we did the program in the designated week and had some great volunteers help our students work their way through the coding challenges. This year, I went it on my own with my class, and I waited a week so that the students work would be saved in the system. The code.org activities are very engaging for my students. The program is challenging, but presented in a way that is very motivating for students. Though the program appears to be self guided for kids, supervision and guidance will make the activities more understandable and lead to greater success in future coding challenges. In the past I have had kids work through the challenges with a partner, but I took the advice of one of our volunteers in fall 2015 and had each student work on his or her own challenge. This was really important to ensure each kid really understood what they were doing and how to get to the next level. I also set up usernames for each student. The usernames and secret pictures were very easy for the students to remember and it ensured that I could see what each student had completed. As each student passed a level, the button for that level turned green. I learned that dark green meant they passed the level with the correct number of lines of code. If the button was light green, they passed but used too many lines of code. I had the light green students go back to correct their coding, and once my students knew about the number of lines requirement, they began making sure they really passed the levels. Motivating the students to do the work correctly was quite easy, giving them clear feedback about what was expected made them willing to go back and correct their work. Usually I would experience more requests for mercy and leniency, but with coding, the students wanted to do it correctly. All this would be much more difficult to include in our program if we did not have Chromebooks in our classrooms for regular use. My thanks go out to our Information Technology Department in San Rafael City Schools for supporting our use of Chromebooks and to our School Board for approving the expansion of our Chromebook program. In Reading Challenges and Opportunities part 3, I described what my colleagues and I call the internal resources of our most successful students. Successful students are overcoming challenges to become proficient readers. Internal resources we observed in these successful students include: family loyalty, curiosity, and the capacity to persist in the face of challenges. In this post, Reading Challenges and Opportunities part 4, I will seek to explain how we used the program Scholastic Reading Counts to help all our students develop these internal resources. Scholastic Reading Counts has helped our students build reading comprehension skills by rewarding them for regular practice reading real literature. Scholastic Reading Counts has quizzes to test how well a student has comprehended thousands of books. Students read books at their current reading level and take a quiz on the book. Students are motivated to read more as they pass quizzes on the books they have read. Students like to keep track of how many quizzes they have passed and how many words they have read. Each of our classrooms has a large wall chart where we track how many quizzes students have passed and how many words each student has read. Students compare their own progress other students’ progress. We also track the number of words our whole class has read. We have conferences with our students about their reading progress on a regular basis, ideally once every month. In that conference we review the quizzes they have passed, their growth in reading fluency and every two months their growth in reading comprehension as measured by the Scholastic Reading Inventory (SRI). In these conferences, students see the relationship between the number of quizzes they have passed and the trajectory of their SRI – reading comprehension score. Students who are making upward growth on the SRI are the same students who have been reading and passing SRC quizzes regularly. Students whose SRI scores have not grown review the number of quizzes taken and the difficulty of the books they have read and set goals to read more books that will help them increase their SRI score. So, you may ask, how does the program help students develop the internal resources you identified? The internal resource of family loyalty and pride is developed because students like to show their parents how many quizzes they have passed and their growth in SRI scores. The program also helps parents be more motivated to encourage a regular reading habit as parents can clearly see the growth their child has made. The internal resource of curiosity and love of learning is developed because students read more. As students read more they begin to be motivated by an enjoyment of learning, not just seeing the number of quizzes they have passed. The internal resource of persisting in the face of challenges is developed, as the rewards for students’ efforts are so clearly evident. Using the program regularly allows us to identify students who need more support to develop as readers. There are always a handful of students who struggle to pass quizzes, despite reasonable efforts. The program lets us know who needs more of our attention and gives us one more piece of evidence to pass on to reading specialists. Thank you for reading this four-part post called, Reading Challenges and Opportunities. I began writing it with the intention of explaining how we use Scholastic Reading Counts with our students. As I wrote, I realized the program has been more than simply a reading quiz program. The program has helped students build internal resources that will help them be more successful in all areas of their lives. These internal resources will help them overcome the challenges they face as English Language Learners with low socio-economic status and low parent education levels. In my last post I wrote about how my colleagues and I identified challenges our students must overcome when learning to read as well as the internal resources they possess that we seek to help them recognize and use as they surmount those challenges. Our students’ home language is not English, they live in low socio economic conditions and most parents have not completed high school. In this post I will elaborate on how these issues show up in our school environment and effect student learning. At my school, most of our students have been with us since Kindergarten, so student mobility is not a big issue. Almost all our students begin Kindergarten at a beginning level on the California English Language Development test (CELDT). When they reach fourth grade most of them have reached an intermediate, and some an advanced level on the CELDT. Often they have deficits in phonics skills that native English speaking kids usually master in the primary grades. Our teachers are teaching the explicit phonics skills students need, but I believe some students are so busy learning to understand English that they miss key elements of instruction in the early school years. English Language Learners need to learn strategies that help them understand inferences in reading comprehension tests, and there are often English idioms that confuse students. Our students come from homes with low socio-economic status and most parents have not finished high school. These factors suggest that our students have not had as much exposure to oral language, whether in English or Spanish as students from middle and high income homes, prior to coming to school. Parents may have to work long hours, may not know the importance of talking to young children and a nightly bedtime habit of reading books together is not yet a part of the cultural norm in many homes. Our amazing school outreach coordinators are helping our parents learn to implement these fun family reading and language rituals that will help their kids be more ready for learning at school. So these are some of the challenges our students face when it is time to read in fourth grade. In my next post, I’ll discuss the internal resources our students and their families possess that we work to emphasize to help our students blossom as grade level proficient readers. Maria loved books, every day at free reading time she would quickly settle in with her book box and begin reading. Maria’s reading fluency scores were on target, but when it came time for Maria to take a reading comprehension test, her scores did not match her enthusiasm for reading. Rico read every Ranger Rick magazine and animal book in the library over the course of the year. Rico’s weekly homework reading log was always completed well. Rico worked hard in all areas of class, but his Reading Comprehension scores were also below grade level. Both of these students loved reading, but they did not comprehend what they were reading well enough to perform at grade level. Then there are students whose challenge with reading is more obvious, like Theresa. Theresa had difficulty settling on a book to read, within minutes of sitting down with her book box, she would be up, perusing the classroom library, looking for something different to read. Theresa’s scores for both fluency and reading comprehension were below grade level. The area of concern that I wanted to address in my classroom was reading comprehension. I wanted my students reading at grade level and I wanted their comprehension scores to match their love of learning, reading and books. In order to address this area of concern, I brainstormed with my grade level colleagues to consider causes of the deficits in my students’ comprehension. Here are some of the challenges we identified: almost all of our students begin Kindergarten as beginning English Language Learners, they come from homes with low socio-economic status and most of their parents have not finished high school. In my next post I will write more about how these challenges create gaps in student learning. We also brainstormed internal resources our students and families possess that they can draw on to increase success in school and life. These internal resources include: Family pride and loyalty, love of learning, and the ability to persist in the face of challenges. Taking into account both student challenges and internal resources, we began to brainstorm what we could do to close gaps in student learning, and also how we could help students identify and use their internal resources to take charge of their own learning. In my next post, I will examine the challenges and internal resources of my students, and explain how our grade level PLC team chose to address those challenges and support students to recognize and use their own internal resources. Every year, I notice a change in student behavior that starts a week or so before spring break and grows more challenging as the school year comes to a close. Sitting through a lesson becomes increasingly more difficult and even my model citizens have moments of foolishness. I blame it on spring fever, as the longer, warmer days of spring make us all want to spend more time outside. My students and I grow tired of the routines that worked so well for us since fall. Whatever causes this phenomenon, in spring of 2014, I decided to try adding brain breaks by GoNoodle.com to break up our daily routines. This new addition helped me and my students get through the end of the year drama with flying colors. I found the GoNoodle online program while reading an article on the Edutopia Website. GoNoodle has a large selection of video clips to guide students in dance routines, and also breathing and mindfulness routines. The dance routines perked us up and the mindfulness exercises slowed us down and helped us refocus. I have a mounted projector hooked up to my computer, so it was easy to begin playing GoNoodle videos. My students were very excited and stayed attentive through lessons to earn the next Brain Break. As they did Brain Breaks, we earned minutes (these will be called points in the 2014-2015 school year) that my students found quite motivating. As our minutes added up, we had goofy characters called Champs who went through a metamorphosis from goofy looking small guys to wild looking big guys. My students observed that the more ugly the Champs were when they were little, the cooler they looked at the end. As we finished building up each Champ I printed out its picture and that became a highly coveted award that inspired good behavior. Examining this classroom dilemma using the Action Research model, I began by reflecting on an Area of Concern, or classroom dilemma. The problem I wanted to address in a positive way was how to deal with student inattentiveness and misbehavior. This problem was beginning to increase just prior to our spring break in April of 2014. I knew from past experience that the challenge would grow as we approached the end of the school year. I wondered if this problem might be managed through the use of brain breaks provided by GoNoodle. I formed my problem into a question. 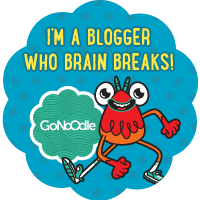 What will be the effects of GoNoodle Brain Breaks on end of the school year wiggles? The data I collected to study this classroom problem included student completion of tasks, focus on lessons and overall classroom mood before and after we began doing Brain Breaks. My students enjoyed the Brain Breaks, whether active or mindful, very much. Students worked hard to complete our lessons so that they could earn another Brain Break. Brain breaks increased a positive mood in our classroom, for students and for me. Whether we were trying our best to do a Zumba dance routine, or learning to breathe deeply while traveling around the country and learning interesting facts about places in the United States, students participated and I sensed more happy, positive energy and decreases in the inattentive, and unsettled behavior in my classroom. In this next series of blog posts, I share some of the ways I use digital technologies to enhance student learning in my own classroom. As I implement new technologies I use an Action Research model to help me systematically explore each new program or tool. How do I define Action Research and apply it to my classroom practice? At the school where I teach, grade level teams meet in Professional Learning Communities (PLC) on a regular basis. In the last two years our practice has been to select 3-4 students in our classrooms to focus on as a team during the year. We selected reading fluency as an area of concern. We tried different strategies to build fluency, and then assessed fluency, shared successful strategies and described struggles. This sharing helped each of us grow and improve our practice. This work is a form of Action Research. Action Research is something good teachers regularly do. We may not call it or think of it as research, but teachers regularly reflect on classroom practice and the effects of our practice on student learning. Through a lens of Action Research I become more aware and systematic. Critically reflecting on classroom practice increases my sense of confidence and my understanding of teaching best practices. Action Research is sometimes called Teacher Research. 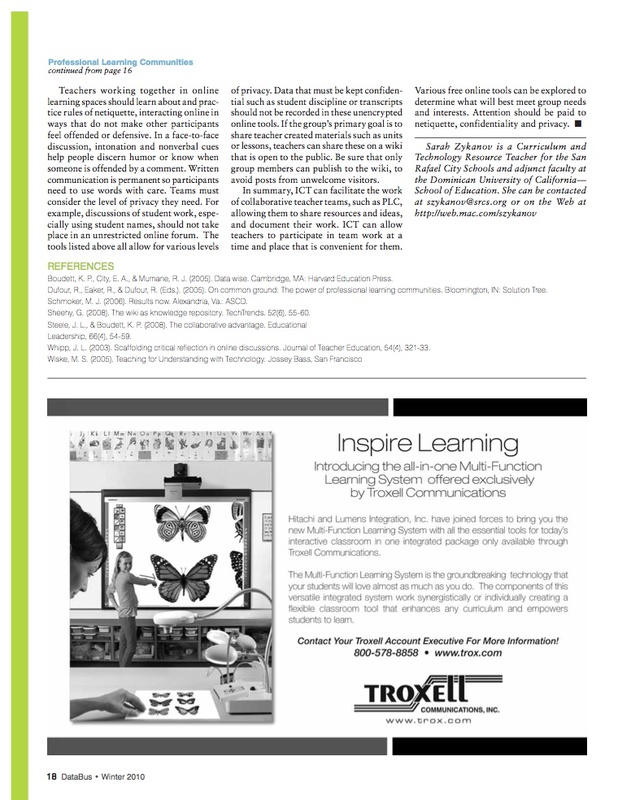 How might digital audio recorders increase student engagement in reading fluency practice? 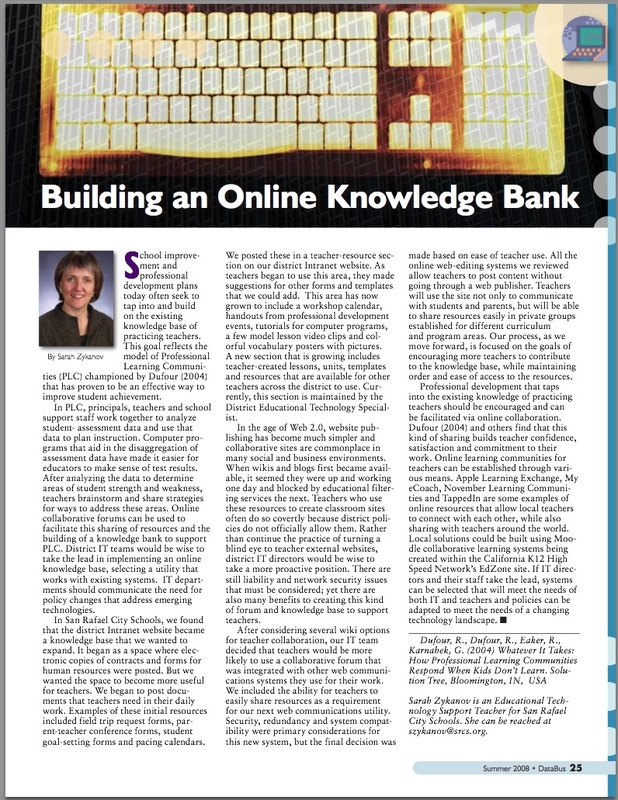 What effects does an online reading intervention program have on learners? In what ways will the introduction of brief active breaks between class activities effect student behavior? The Action Researcher/Teacher Researcher collects data, reflects on it and plans a course of action to study the question. The Action Researcher/Teacher Researcher reflects regularly on the question and refines the study as the school year progresses. Qualitative (written) data, such as interviews with students, and teacher notes of observations from the classroom. Quantitative (numerical) data might include reading comprehension scores, attendance rates or reading fluency scores. This data provides feedback that allows the teacher to adapt and refine the action plan. Unlike traditional research there are no control groups and test groups. Students in a control group do not receive a treatment, and students in test groups do receive a treatment. In Action Research there is only an intact group of students who receive the same treatment, usually with their classroom teacher as the Action Researcher/Teacher Researcher. The goal of Action Research in the classroom is to provide teachers with a systematic model to guide the study and improvement of teaching practice, while in the process of teaching. Unlike other forms of research, Action Research is seldom written up into articles. Classroom teachers are busy planning and preparing to lead engaging lessons and activities and have little time or energy left for writing. But this is a shame, because such articles may give other teachers helpful information and inspiration to try new ways of approaching old problems. The goal of this blog post has been to give you an overview of Action Research. I follow this model to help me systematically explore the use of new technologies for student learning in my own classroom. In this series of posts to my Blog, I share some of the ways I use digital technologies to enhance student learning in my own classroom. I welcome comments and constructive criticism as well as questions about what I have shared. Mohr, Marian – George Mason University Teacher and Action Research Resource website.